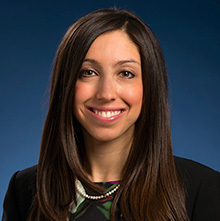 Danielle Rodin, MD, MPH, FRCPC, is a radiation oncologist at Princess Margaret Cancer Centre and an Assistant Professor in the Department of Radiation Oncology at the University of Toronto. She was the 2017-2018 Canadian Harkness Fellow in Health Care Policy and Practice in the Department of Health Policy and Management at the Harvard T. H. Chan School of Public Health and has published more than 40 peer-reviewed papers in the areas of health technology assessment, global health systems, and large database analyses of cost and quality in cancer care. Rodin also recently worked as a Consultant in the Division of Human Health at the International Atomic Energy Agency, where she focused on the implementation and sustainability of radiotherapy programs in low-resource settings. She has been actively involved in the UICC, having twice received the Young Leader Award and has led successful advocacy movements using for improving access to cancer treatment using films, blogs, and other multimedia. Rodin received her B.A.(Hons.) from McGill University, her medical degree from the University of Toronto, and her Master of Public Health from Harvard University.